This is with reference to my earlier post, I am also attaching the Latest X RAY's along with the XRAY's before injury. 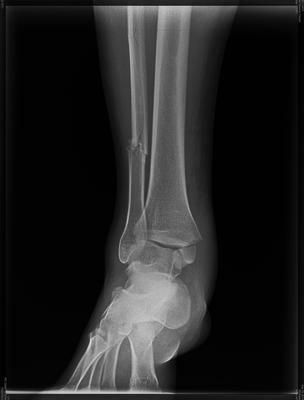 Though the swelling has reduced considerably on the fibula side,but the muscles have concentrated on one area on side of the plate and not uniformly spread.They form a small ball like shape at the end of the day as you can see from the first XRAY. I has been almost 11 months now after the surgery.I have started light running to start getting into an exercise routine, I used to before the injury, Is that advisable. ANy extra info will be really helpful. I think the person who should be giving you advice is your surgeon as he or she is much, much more familiar with your situation, AND, can actually examine you. As I stated in my original post, the fact that you have so much hardware inserted in the fibula bone has probably contributed to the bulge in your leg and I am not sure anything else can be done. That is compounded by the fact that the surgery was the result of trauma so your surgeon had to work around the problems presented and in those cases makes planning the procedures more difficult. If you are relatively pain free and are "living your life" than I am not sure anything can be done.